About Jim and Holly Cutting and their accomplishments. 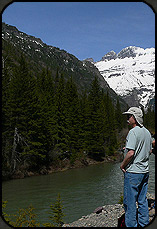 Our favorite fly-fishing and camping spot, the South Fork of the Flathead River. Greetings from Montana where our studios are located in one of the most beautiful areas in the state. It is west of Kalispell and not far from Glacier National Park. We feel so fortunate to be in such a magnificent place where we are inspired daily to create our artwork. We can't say enough about this incredible area where we live. 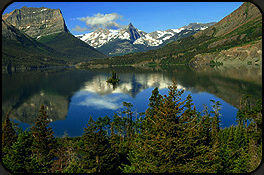 Glacier National Park has spectacular scenery, endless hiking trails, lots of wildlife and wonderful wildflowers to observe. We are sure you will fall in love with this area as we have. Come see and enjoy Montana for yourselves. We spend a lot of time creating, preparing and participating in arts and crafts shows. 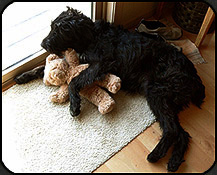 If we happen to find any spare time, we love camping with our dogs, picking huckleberries, xcountry skiing, river rafting and our favorite past time.....fly-fishing. We have combined our talents creating unique stone mosaics, handcrafted tables or boxes, fine art mixed media paintings. Look for us in our Buffalo Trail Artworks booth at juried arts and crafts shows throughout the west.  Check our schedule listed on our 'CONTACT' page. We hope to see you there. 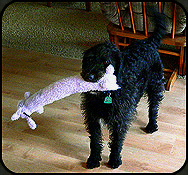 Jim had been a mason for over 25 years and well known for his masonry in Ohio (where he grew up) and in Montana. He has done many custom and artistic projects with stone, brickwork and masonry fireplaces. He's been published in various trade magazines and numerous articles have been written about him in newspapers. 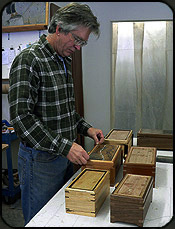 He has also done carpentry and woodworking for many years building numerous homes in Ohio and Montana. He finds working in his shop to be less back breaking and just as rewarding, and he'll say definitely more fun. See some of his beautiful woodworking in the galleries BOXES and TABLES. Holly is a talented artist enjoying working with various mediums. 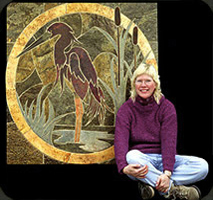 Winning numerous awards for her paintings, etchings and tapestry weaving's, she never stops being creative. She grew up in Ohio and was surrounded by a circle of family and friends who were artists. So you can say her talent comes naturally. She attended college for a Bachelor of Fine Arts degree in Ohio, New York and PA. She has had several one woman shows and has had her artwork shown in several publications. 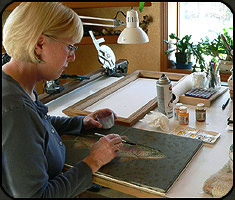 Most of the time you can find her in her studio enjoying herself creating something that is always from the heart. 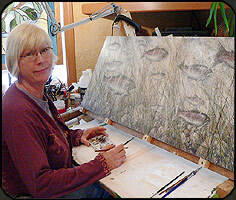 See her paintings and other artwork in the PAINTINGS gallery pages.